The mastermind behind one of Android's most popular customization tools talks about his own home screen setup -- and why big-screened devices aren't for him. 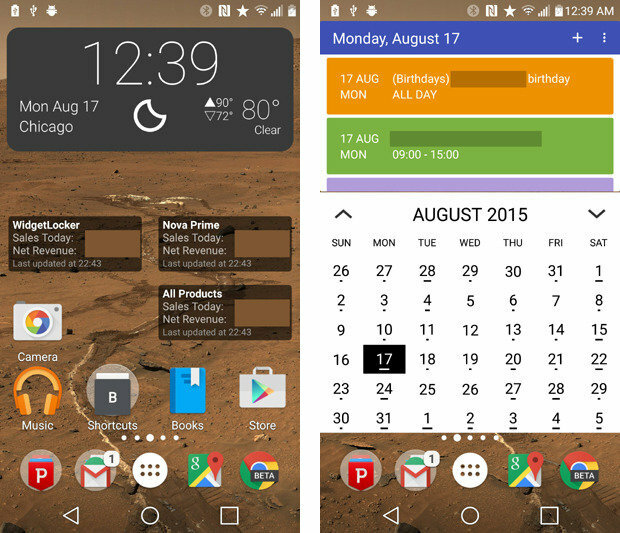 Few apps are as consistently loved and relied upon by Android enthusiasts as Nova Launcher. 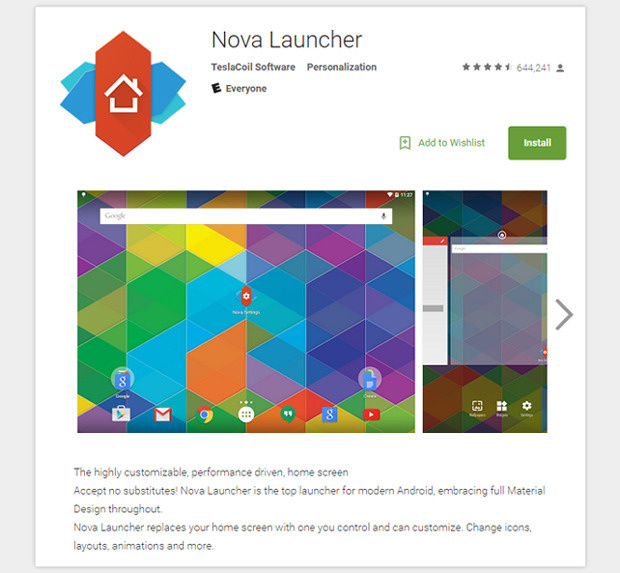 Widely considered the de facto do-it-all home screen replacement for power users, Nova picked up where Android's original launchers left off (here's lookin' at you, ADW) and quickly became the go-to tool for those seeking total control over their home screen environments. Perhaps most impressive: The app is the brainchild of one guy -- not a huge company or giant team, but just one guy who wanted to make Android better. These days, Barry has a bit of assistance -- like that of Liam Spradlin, a visual designer who helped give Nova Launcher its recent Material Design makeover -- but he's still the driving force behind the app's development. And by all signs, he's still killin' it. Nova Launcher's $5 "Prime" version is currently #23 on Google's list of the top paid Android apps -- which is even more remarkable when you consider that almost every entry ahead of it is a mainstream game, many of them by big-name firms like Electronic Arts, Cartoon Network, and Nickelodeon. Not to mention the fact that the main Nova app is actually free to use; the paid portion is merely an extra-feature-unlocking upgrade. So how does a person who's influenced the way so many of us use Android use the platform himself? After many years and countless hours of enjoying Barry's work, I thought I'd ask. In his own words, this is how Kevin Barry uses Android. Your current primary phone: I've just switched from the Nexus 6 to the LG G4. When the Nexus 6 was released, I wasn't sure about the screen size but figured I'd give it a try. Sometimes it was great, like lounging around home. But if I'm trying to text one-handed while walking, it's cumbersome, and it can feel awkwardly large in my pocket. I haven't made my mind up on the G4 yet. I'm pleased with the size of the phone -- still lots of screen space but a much smaller footprint. I'm not a fan of LG's skin, but it's interesting to see what works and what doesn't. They've come a long way since the Optimus G. I thought the buttons on the back of the phone would bother me, but they really don't. What case is on your phone (if any): I don't use cases or screen protectors. I generally don't like how they look or feel. My phones do get a bit beaten up, but it's not an issue as I don't keep a single phone as my primary for too long, and test devices can be beaten up. I've yet to damage a device bad enough that it can't be used as a test device, and I'm not sure a case could protect that kind of accident, anyway. I did crack the screen on my first-gen Moto X, which was unfortunate as I was enjoying that phone. But I demoted it to a testing device and promoted one of my test devices to primary until the new Nexus that year was released. Your current tablet (if any): I hate tablets. I really want to like them -- I think it's important for me to use one as a number of my users use them. But I just haven't found a reason. Most of the day, I'm at my desk, with two 27-in. monitors hooked up to a real computer with a comfortable physical keyboard. After work, I'm generally with my son, and it's easier to pull out and put away a phone rather than a tablet. If my wife and I are looking at something online together on the couch, we use a laptop. But as I said, it's important for me to use one. So I try to use my Nexus 9. I like the 4:3 ratio on the Nexus 9. I have the keyboard dock, hoping it'd encourage me to use the tablet for emails, but mostly I just use it to test. As a side note, I do use and love the Satechi R1 Arm tablet stand. It works for phones or tablets and is very adjustable. When testing, it means I don't need to look down at a flat phone on my desk or keep it in my hand the whole time. I've found that most phone stands aren't very sturdy or don't handle phablets well. My only complaints about the R1 are that the ledges at the bottom tend to cover capacitive buttons on Samsung phones, and they can get in the way of devices with off-center USB ports (like the Huawei Mate2). Your current smartwatch (if any): I'm not really using one. I have the G Watch and Moto 360 from Google I/O and went through a period of wearing one every day but eventually stopped. Lately I've been trying to give the Moto 360 another try, but just occasionally. It's handy when out on the bicycle. HD Widgets clock, Appmonger widgets for daily app revenue, and some shortcuts. The other for my agenda, which is made from two Today Calendar widgets. One feature I love about Today's agenda widget is the "Show prefix" option. I have a couple of other people's calendars on there, too, and it helps provide context. In addition to the two home screens I use, I have five others for staging and testing. These come and go depending on what I'm working on. Right now, one is completely empty, the other has something I'm testing, and the other has something I was testing but haven't looked at lately. What launcher you're using: Launcher Pro. Just kidding -- obviously, Nova Launcher. I love it for a lot of the same reasons my users do, such as the gestures, app search in the drawer, and the animations. But also, since I'm the developer, I can add in things that I need or want, even if most users don't. 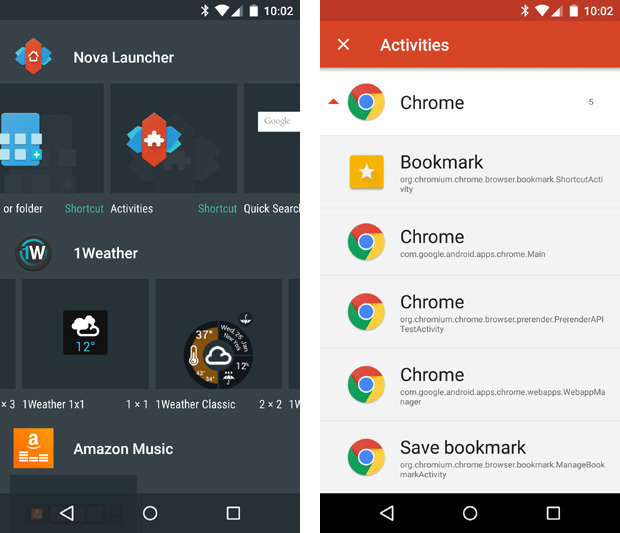 For example, Nova's Activities shortcut links directly into an activity within an app. Users use this for tricks like linking to a specific settings screen or a compose window in a messaging app. I use this to explore new Android versions or OEM skins and so I added the ability to long-press on an activity to launch it right away (without creating a shortcut). Most people don't know about this or need it, but I do, so I can put it in. I also have an option to add "Export PNG" to the quick menu when long-pressing a shortcut or widget (Nova Settings > Long-press volume down for Labs > Debug > Show Export PNG). I use it for debugging and for doctoring screenshots, as the export has full transparency. Debug builds of Nova also have a "Shuffle" option in folder menus to randomly sort them. I use this when testing the "Sort" option or just when I want to see lots of icons jump around. What wallpaper you're using: Lately, I've been on a NASA kick for my wallpapers, so I'm using a cropped version of this landscape of Mars. My computer has Pluto on one screen and Charon on the other. The sizes are to scale but not the distance, as it wouldn't be practical. News: Press (RSS Reader), Sync for Reddit, Google+, Pocket, and a few Hacker News apps as I haven't settled on one yet. Comm: Gmail, Hangouts, Messenger, Phone, Slack. Chrome Beta (swipes to open a folder): Chrome Beta, Chrome, and Firefox. Beyond the obvious stock Google programs, a few apps you can't live without right now (and a quick word about why): Pushbullet and Pocket are really great. I spend a lot of time watching my son, and if he's playing peacefully by himself, I can browse the news. But some things I just want to push to my computer to check out later. Likewise, sometimes I find a nice long article that I'm not going to read in one go and save it to Pocket to read, either from my phone or my computer (or both). As a developer, App Stats and Appmonger are great to keep an eye on how my apps are doing, especially after I release an update, but also during other events like competitors' updates or system updates. Check out other "How I use Android" profiles below (scroll down) -- and stay tuned for even more entries in the weeks to come!